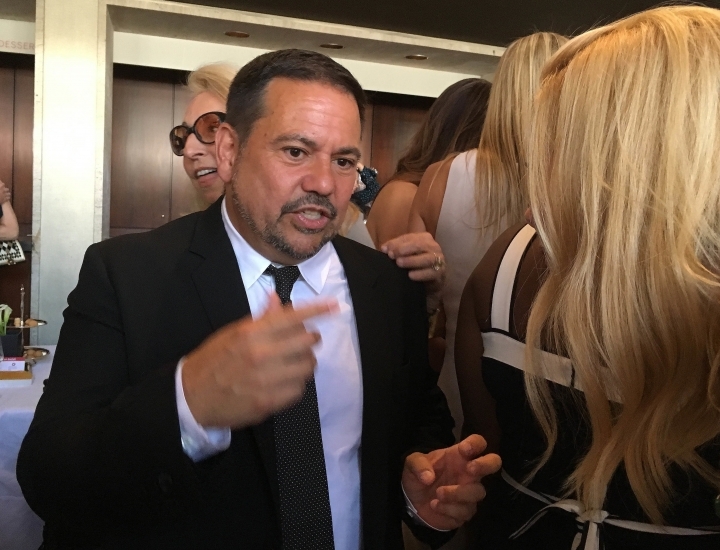 NEW YORK — Designer Narciso Rodriguez is good at a lot of things — some would say masterful, especially when it comes to making striking, unfussy clothes that women feel great in. He couldn't do it in June, when actress Claire Danes lovingly presented him with his lifetime achievement award from the Council of Fashion Designers of America. And he couldn't do it this week, when honored again by the Couture Council of the Museum at the Fashion Institute of Technology. Both times, the minute he started thanking friends and family, he was toast. It's been quite a year for the soft-spoken Rodriguez, 57, the son of Cuban immigrants whom he largely credits for his success. But for years now, really, he's been one of America's most admired designers, a man who evokes the kind of grateful loyalty from his high-profile clients that most designers can only dream of. Some of those clients, like Danes, who's been wearing his clothes since she attended the Oscars at 16, describe Rodriguez as family. She has said the common thread in a Narciso garment is that "I always feel most myself when I wear them." That's exactly what Rodriguez says he's aiming for: that a woman feels like herself, not the personification of a designer's fantasy. "I try not to let my designer ego get in the way because it's about making THEM look beautiful," he said in an interview Wednesday, moments before receiving his Couture Council award. "It's not about the press that I'm going to garner or anything else. And I think that's why so many women have trusted me." AP: You've had quite a year with these various honors. Rodriguez: I never placed a good deal of importance on awards. But it's so wonderful when your peers, in this case the Couture Council, recognize your work and your career and take a moment to say, 'Wow, you've been doing this for a good amount of time, and you've been consistent.' The respect that I've been feeling from peers and the press, it's just such an amazing feeling. And wow, longevity in fashion is rare. AP: Does all this recognition make you wonder if it's downhill from here? Rodriguez (laughing): I'm not there yet, I'm just grateful that I've been able to do it for this long, and do it on my own terms. And sometimes that hasn't been easy, I've had ups and downs. But I'm still here. AP: How do you explain the close relationships you've forged with some of your celebrity clients? Rodriguez: Well, I have never had a financial relationship with a celebrity. Never. The relationships I have cultivated have grown organically, and honestly. I met Claire when she was a very young girl. A teenager. And we just welcomed her second child into the world and I choke up (NOTE: he does choke up here) because she's like a daughter to me, someone I love so much. The same thing with Jessica Seinfeld, and Julianna Margulies, and so many women that are incredible inspirations to me, but they're also family. Rodriguez: Absolutely. I remember when I first started out, I would hear things from the sales associates, who would tell me that a woman might not necessarily be convinced to go to the rack and pick up a garment, but once she tries it on and sees how it feels, (she's) a customer for life. But it took a while. Rodriguez: It's hard sometimes to put your fingers in your ears and drown out the noise, because fashion is seductive. And you can be fooled by the glamour and lose sight of the fact that it's about the craft — for me, it's about beauty, it's about creativity. It can be overwhelming, more so even today where it isn't really about the craft, it's about self-promotion, and about Instagram. I'm incredibly private; I've had to expose a lot of myself because of my work, but it's not something I enjoy. AP: So you're not a selfie person? Rodriguez: It's tough today, when everyone wants to be famous first. It's just so confusing. I do what I have to. But I grew up in a time where, I'm sure you remember, if somebody walked in on you and you were staring at yourself in a mirror and taking a photo of yourself, you'd be mortified! You wouldn't want anyone to see that side of you. And that's the side that so many people want to expose today. It's fascinating. AP: You're not showing at this Fashion Week. Why? Rodriguez: I changed my life. My twins Callum and Ivy (with husband Thomas Tolan) are 15 months old. We took the summer off for the first time in 20 years, and I was so happy. I'll show in December instead. Nothing will replace this summer with my children at the beach. It's just given me a whole new perspective on life and work and what's really important. AP: I guess it's time for you to go get that award. Rodriguez: Yes, I hope I don't get out there and just bawl.